At the start of the year the Arsenal captain of 1959-1962 passed away. The apparently muted initial response to an ex-Arsenal captain dumbfounded a number of supporters as it didn’t seem to expound the respect deserved of a man who had played for Arsenal for nine seasons, and skippered the side for a third of that period. Shortly afterwards the Arsenal did Vic proud with an excellent article on him in the programme for the Leicester game. At the start of this month Ernie Crouch died aged 91, hit by a bus on the way to the Sunderland game on 5 December. He had followed Arsenal since the mid-1930s and, quite rightly, his demise was noted and respected by many who knew him and others within the Arsenal crowd. Piebury Corner even made a special seasonal pie in his honour with proceeds going to the local homeless in the Islington area. Just as we had finished these tributes, the great Arsenal and England coach Don Howe passed away. Don was linked to Arsenal on and off from 1964, and was a huge part of both of our formative years as Arsenal fans. His is the final tribute to these ten Gunners who all sadly passed in 2015. It is heartening to know that Don will be a central part of the programme for today’s match. During family history research I came across the Sunderland FC manner of showing respect to their ex-players and staff who pass away each year. Each year during the final home game of the year the programme lists and talks about each person with a link to Sunderland Football Club who has died during that year. Additionally, they hold a minute’s silence to show their respect in the ground before the game. For instance a very distant relative of mine, Barney Bircham who appeared in 70 odd matches for the Black Cats during World War 2, was commemorated in such a fashion, alongside amongst others the tragically young Ian Porterfield, in 2007. For those who aren’t of our mature vintage, in the late 60s and early 70s Leeds United were disliked more than Chelsea are now. In the 1973 FA Cup final Porterfield scored the only goal to defeat Leeds at Wembley, hence he was well liked not just by Wearsiders. 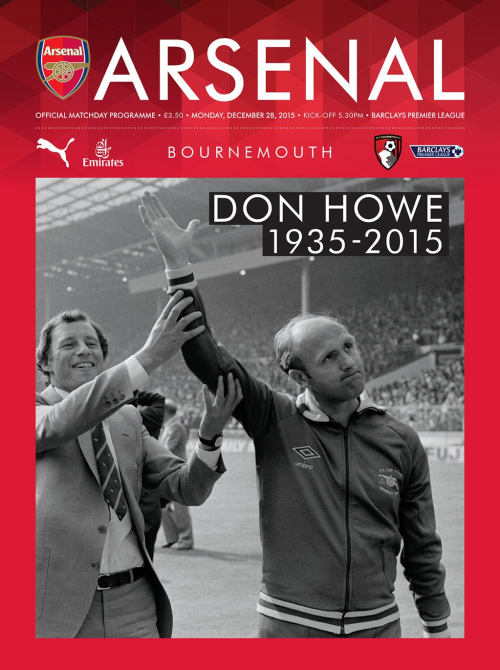 So, Andy and myself had a chat and decided to produce our own tribute to Gunners players and staff who have passed on during 2015 to coincide with the final home game of the season against Bournemouth, just as Sunderland do in a grand show of respect, organised by their Historian and Programme Editor, Rob Mason. Please feel free to add your own remarks in the comments or note an Arsenal fan who has died this year to add to the tributes. Really great idea to recognise all people who have represented Arsenal . I well remember watching Vic Groves , Ian Mckechnie and Jimmy McGill in the 60,s and although the latter only played some 10 games he came to London from the same Scottish Youth Club as Eddie Kelly which probably accounted for the lack of first team opportunities . Ken, from a tweet today it is apparent that QPR do the same as Sunderland. What a wonderful suggestion. Don Howe was probably the most influential person at Arsenal when I lived in London in the sixties. having been the team Captain and then head coach. I am certain that many of the subsequent Arsenal legends owed him a debt of gratitude. The obituary of Don Howe is now on the site.